In India, as per Census, 2001, the number of persons with disabilities is 2.20 crore, which constitutes 2.13% of the total population. In 1969, the Government approved a scheme for giving National Awards to outstanding employers of persons with disabilities as well as outstanding employees. These awards have been instituted with the objective to focus public attention on issues concerning persons with disabilities and to promote their mainstreaming in the society. The scope of the scheme has been amended from time to time, keeping in view the changing scenario. 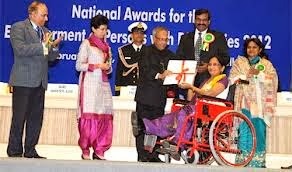 The National Awards are conferred by the President of India on 3rdDecember every year on the ‘International Day of Persons with Disabilities’ on outstanding Persons with Disabilities and individuals and organizations that are working for the empowerment of persons with disabilities. Empowerment of persons with disabilities is an inter-disciplinary process, covering various aspects namely, prevention, early detection, intervention, education, vocational training rehabilitation and social integration etc. Apart from resources, it requires dedicated efforts of persons and institutions involved in the process of empowerment. Awards for the Best State in promoting empowerment of Persons with Disabilities and Best Sportsperson with Disabilities have been introduced from this year. Ministry of Social Justice & Empowerment writes to the State Governments/ Union Territory Administrators/ Central Ministries/ Department/ District Collectors and Press Information Officers of the State Government calling for the nominations for the National Awards in various categories. The advertisements are also published in the national/regional language daily newspapers and Doordarshan to give wide publicity of the awards. The scheme of National Award is also displayed on the website of the Ministry (www.socialjustice.nic.in) from where aspirants of National Award and other persons may download application forms and details of National Award Scheme. For short-listing of the applications under various categories of awards, nine Screening Committees were constituted. A total number of 495 applications were received and these were referred to the Screening Committees for short-listing. The meetings of the Screening Committees for short-listing of the applications received were held on different dates. The National Selection Committee chaired by Minister of State, Shri P. Balram Naik submitted its recommendations for approval to Minister of Social Justice & Empowerment, Kumari Selja. For the year 2013, the awards will be presented to 44 individuals/organizations in 14 different categories.